• Large quanity thunderstix noisemakers are ideal promotional products for businesses and organizations looking for an effective and inexpensive logo inflatable. Distribute among masses to receive instant brand recognition. • Imprint your personalized thundersticks with your logo, message, contact information, or any other artwork. We offer free artwork design and proof services! 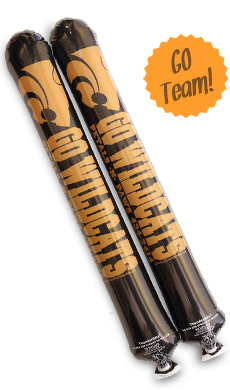 • Thunderstix noisemakers are made with our durable, high quality material. Sold in pairs of two.